This weekend, weather permitting, SDOT crews will be repaving the block of Mercer St between Yale Ave N and Eastlake Ave E.
We’ll be removing the top two inches of the street surface along this block, and smoothing it out with new asphalt. Closures | Mercer St, Yale Ave N to Eastlake Ave E, CLOSED during working hours. Yale Ave N, Republican St to Mercer St.
Mercer St, Pontius Ave N to Yale Ave N.
No parking signs denote where parking is restricted. We appreciate your patience during this important street maintenance! Urban Forestry Landscape Crews will be weeding and mulching medians along Sand Point Way NE, next week. Inside lane of NB Sand Point Way NE, NE 65th St to Princeton Ave NE. Inside SB lane closure along that stretch, closer to 9 AM. Contact our Urban Forestry team at seattle.trees@seattle.gov, or visit their web site for more on their work. 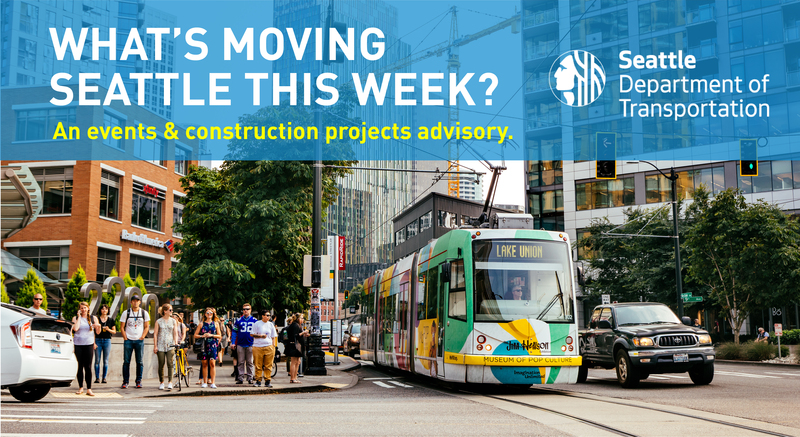 Thank you for your patience as we work to maintain Seattle roadways! Concrete makes schedule less concrete. Crews work along 35th Ave SW on the Arbor Heights Safe Routes to School Project. The Arbor Heights Safe Routes to School Project is making headway, though slowed a bit by the concrete shortage; there hasn’t been enough to go around to meet schedule needs due to the pull from so many public and private construction projects in Seattle. Today, crews are finishing up pouring concrete for the 35th Ave SW curbs, between SW 100th and SW 102nd streets. Concrete for driveways is scheduled for Monday. Closure | 35th Ave SW is fully closed between SW 100th St and SW 104th St during work hours; 35th Ave SW will be open for the weekend. Plan is to pour concrete for all driveways Monday–so by Tuesday residents should be able to park on their driveways again! Crews will also install asphalt paving against the curb, where gravel used to be. Closure | 35th Ave SW will be fully closed between SW 100th St and SW 104th St during work hours. General | Water shut-off 9 AM – 6 PM – Seattle Public Utilities notified impacted residents on 35th Ave SW and 36th Ave SW between SW 100th and SW 104th St; and SW 102nd St between 35th Ave SW and 36th Ave SW.
To reach the project team, please email PedestrianImprovements2@seattle.gov or call 206-615-0786.